How to Get from Lisbon Airport to Sao Martinho do Porto? If you are planning your holidays in Sao Martinho do Porto you will probably be arriving at Lisbon Airport. Upon arrival we advise you not to catch a public transportation to Sao Martinho do Porto. You will spend the entire day carrying your luggage and switching between buses and trains. Sao Martinho do Porto is located at approximately 105 km north Lisbon, so we advise you to book online a private Lisbon airport transfers to Sao Martinho do Porto. Using our airport transportation services is the fastest and cheapest way to travel comparing to regular taxis. book with confidence. LIS certified provider. Select Sao Martinho do Porto as your transfer destination area and provide us with flight details, Sao Martinho do Porto accommodation address and contact. We automatically process your request for transport availability to Sao Martinho do Porto and send a booking voucher with your transfer confirmation in a matter of seconds. At Lisbon Airport arrivals terminal a friendly driver will be waiting for you next to a placard with our website logo. For the return transfer we will pick you up from the same address in Sao Martinho do Porto. And remember, you can always pay later to the driver for both your arrival and return Sao Martinho do Porto transfer. How far is Sao Martinho do Porto from Lisbon Airport? How much will it cost? How long? The travel distance between Lisbon Airport and Sao Martinho do Porto is 105Km and transfer time takes approximatly 70mins under normal traffic conditions. We provide private Lisbon airport transfers to Sao Martinho do Porto. Our direct Lisbon taxi transfers have fixed prices and are the faster, affordable and mind free alternative transport to get you there. At the Lisbon airport arrivals hall a driver will meet you, he will help with your luggage and guide across the airport to your assigned airport transfer vehicle. Your transport may vary between a executive car up to 4 passengers, people carrier up to 8 passengers, mini-bus up to 16 passengers or a large bus up to 27 passengers. In approximately 70 minutes you will be relaxing at your accommodation and appreciating the Sao Martinho do Porto scene. Welcome to Portugal! 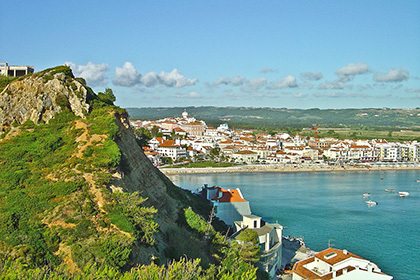 Portugal well known holiday stop, Sao Martinho do Porto is located at 105km north of Lisbon on the Atlantic shore. Their natural bay are favourable to calm waters, witch are ideal for families with kids. Sao Martinho do Porto has a fantastic atmosphere around the beach with lots of cafes, restaurants spread across main avenue. Also you can find hotels, villas and holiday apartments to rent. During the Summer there are lots of activities and festivals to visit. We offer high quality Lisbon airport transfers service, directly to your resort or hotel in the Sao Martinho Area. To pre-book taxi transfers from Lisbon Airport to Sao Martinho do Porto or to other near by destinations take a look at our full list of taxi transfers fares & prices for all the covered locations in Portugal. We cover the entire Lisbon area or any other location in Portugal and also Spanish locations nearby the Portuguese border. Lisbon Airport transfers provided by a minibus fleet capable of carrying up to 27 passengers, modern 16 seater people carrier vans, 8 seater MPVs and premium saloon and estate cars ideal for smaller groups up to 4 passengers. All driven by professional, English speaking licensed chauffeurs.